The first home's responsibility is to score. She starts play in front of the goal and continually positions herself for a shot or to create a shot for a teammate. Second home is an offensive playmaker. She must be able to make shots as well as to feed the ball to her teammates for shots. Third home helps to transition the ball from the defense to the attack. She must be able to feed the ball to her first and second home players as well as to shoot and cover other attack positions as they drive to the goal. 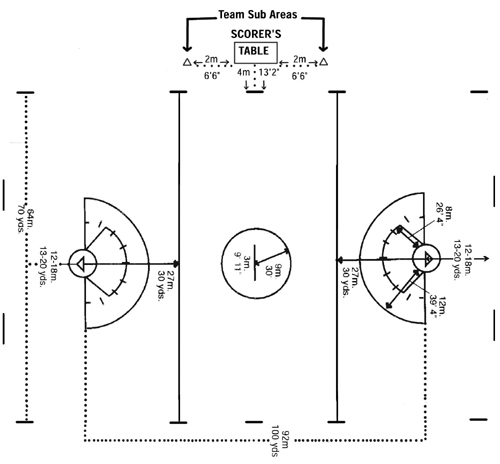 The attack wings are also crucial to the transition from defense to offense. They must have speed and stamina to make the transitions quickly before the opponent can react. The point is primarily responsible for defending against the opposing first home. She must be an aggressive in stick checking and looking to intercept passes. The coverpoint defends against second home and must be able to quickly clear the ball. The third man covers the opponents third home. She must look to intercept passes and clear the ball to the offensive side of the field. The center takes the draw to start play. She must have speed and stamina to play both on the offensive and defensive sides of the field. The defense wings cover the attack wings. They must be quick to bring the ball into the offensive end of the field. The goalie defends the goal and prevents the opposing team from scoring. A good goalie directs her teammates in defense because she can see the field with the play unfolding in front of her.